As Prather delves into Fermentation Technology, a short program offered by MIT Professional Education, she engages and challenges her students. “Do we have a few biochemists? Does this model remind you of anything?” she asks. “It may have been a dark time, but think back to your undergraduate biochemistry class,” she jokes before diving back into her lecture, one of 16 lectures the students will absorb. The course is the oldest in the MIT Professional Education catalog. Since 1962, this intensive program has attracted industry professionals to campus for five days that promise a review of the fundamentals in the application of biological and engineering principles to problems involving microbial, mammalian, and biological and biochemical systems. Fermentation Technology gathers a diverse array of professionals to glean the latest insights on terrain they navigate every day at work. It is an opportunity for them to gain knowledge of what might be coming next in biological and biochemical technology, with an emphasis on biological systems with industrial practices. 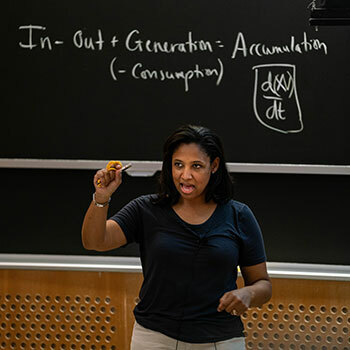 Prather, the Arthur D. Little Professor of Chemical Engineering at MIT, oversees the course with Daniel I. C. Wang, an Institute Professor in the Department of Chemical Engineering. In addition to Prather and Wang, Fermentation Technology features a mix of guest lecturers that include other MIT faculty and industry professionals, such as Neal Connors from Phoenix BioConsulting in New Jersey, Kara Calhoun from the California biotech company Genentech, and Morris Z. Rosenberg, a biotech consultant in Washington. As the room empties for lunch, several of the visiting professionals make quick calls into the office or to check on family back home. Bill Morrison, a facilities engineer at BioMarin Pharmaceuticals in San Rafael, California, explains why he’s flown into Boston for hours of difficult lectures. He is moving into a process engineering role at his company and the course material is helpful for the most part. “I’m weak on the theory, but the other part about the mechanism of production is more up my alley,” he says. Making additional notes at her lecture seat, Soniya Parulekar of Merck and Company, a global pharmaceutical company, has arrived from Philadelphia for the program. She works in fermentation research and development. “A lot of the things I’m seeing discussed in this course are giving me a better sense of what I’m working on — a deeper knowledge,” she says. Soon enough Prather is back from lunch. She begins to animatedly discuss modeling and bioprocess monitoring as industry professionals from across the country settle into their chairs to absorb as much information as they can. There are 2.5 days left of the course. Or to be exact, seven more lectures, including: perfusion reactors, medium design and high cell-density cultivation, power requirement in bioreactors, oxygen transfer and shear in bioreactors, design of experiments, analytics in biomanufacturing, and bioprocess simulation and economics. Attention in the room is still running high.